Written at the height of Wagnerism, this was the first and most popular of the six operas by Goldmark. He was a Hungarian Jew who made his career in Vienna as a renowned composer, but very little of his work remains in the repertory today. This absence is due to a perfect storm of historical circumstance. First, Nazi censors banned all works by Jewish composers from the stage in the years leading up to World War Two. After the war, 20th century music styles moved away from the excess of romanticism toward other musical trends. Goldmark was left in the dust. As conducted by János Kovács, this score (sung in German) proved to be quite a revelation. Goldmark's gift for writing a melody recalls other late Romantics like Saint-Saëns, and his expert assignment of leitmotivs to the major characters and concepts made the drama easy to follow even when the digital subtitle system failed and temporarily showed pictures of kittens. Below that screen, the opera was presented in a traditional, attractive staging with a big staircase, a large trellis structure and a series of scrims to show natural environments (gardens, deserts, etc.) on a tight budget. At the core of the evening's artistic success was the heldentenor of Boldiszár Lászlo as Assad, the hapless Israelite ambassador who rejects his potential marriage due to his attraction to Sheba. Every time his character saw her face, he engaged in what can only be described as a life-ruining aria in praise of her beauty. The proverbial camel's back was broken on his wedding day, when Assad started singing the Queen's praises in the Temple of Solomon, before the Ark of the Covenant on his wedding day. Mr. Lászlo held his resolve through this demanding part, singing with a bright tone that occasionally trumpeted but never grated on the ear. Erika Gál impressed as the titular Queen, a mezzo role written squarely in the center of that range. A full-blooded character with hints of other Biblical femme fatale figures, she soared through her first and second duets with Mr. Lászlo. The mezzo made a final strong appearance in the finale, offering Assad one last chance at redemption in a scene reminiscent of Wagner's Tannhäuser and Venus' final appeal to that Germanic hero. She too, was rejected. Although the Queen has a lot of music to sing, it was soprano Eszter Sümegi who made her mark on the audience. 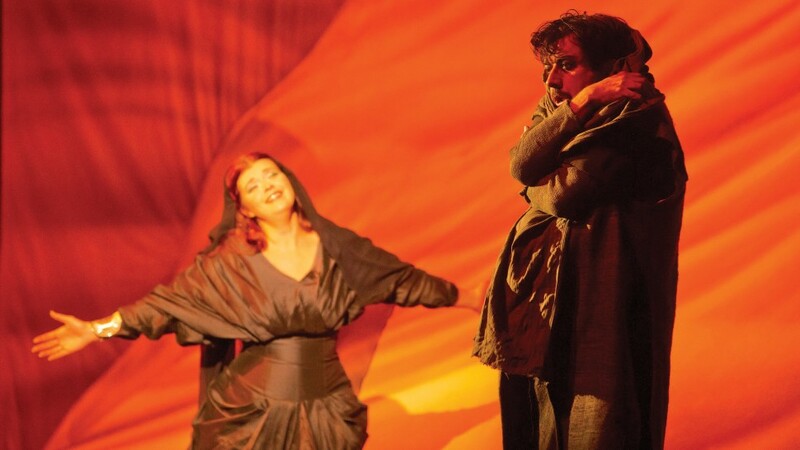 The soprano was ideally cast as Assad's rejected lover Sulamith, whose tragic arc includes getting left at the altar by Assad in the second act and singing a Liebestod-like leb wohl in the third as she prepares to go into exile. In the fourth act, she finds Assad dying in the deep desert and the opera ends with the lovers, doomed, dehydrated, but definitely together. Ms. Sümegi sang with bright and pleasing tone throughout, giving a convincing portrait of the self-sacrificing and pathetique heroine. The biggest star on this stage was the baritone Zoltán Kelemen as King Solomon. (Mr. Kelemen sang Alberich in Herbert von Karajan's 1968 recording of the Ring.) His dark and rich baritone is still pleasing, and he brought a lordly presence to King Solomon. Also solid: bass Péter Fried as the High Priest and Eszter Zavaros as Astaroth. This last is the Queen's servant, who sings a seductive, crooning aria that sets up a tryst in the gardens between Sheba and Assad. The presence of the ballet corps (costumed as exotic animals) and the robust chorus added to the old-fashioned grandeur of this opera, a work from a composer worth bringing back to musical life. If you enjoyed this article, it's time to visit and join Superconductor's Patreon page,. You can get early access to reviews and help support the cost of independent music journalism in New York City at the low cost of just $5/month.